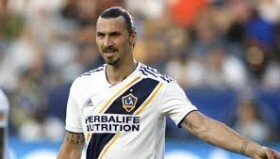 AC Milan sporting director Leonardo has said that it is impossible for the Rossoneri to pursue a short-term loan move for LA Galaxy striker Zlatan Ibrahimovic when the transfer window reopens. The former Sweden international has been a huge hit during his maiden season in the MLS with 22 goals and this has recently linked him with a return to European football with the Rossoneri. However, speaking to Sky Italy, Leonardo has acknowledged that it would be nice for the club to witness a reunion with the Swede but that's unlikely to happen at the turn of the year. He said: "Ibrahimovic? No he won't arrive. He always said that if LA accepted his demands, that he would stay there. He won't be arriving here. It would've been nice but it isn't possible." Milan managed only a goalless draw against Torino in their recent league meeting but they are still occupying the fourth position in the standings with a one-point advantage over Lazio.